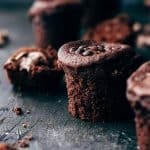 This is the best Double Chocolate Muffins Recipe you will find. Rich, moist, chocolatey, easy. Just 10 minutes and 10 ingredients. 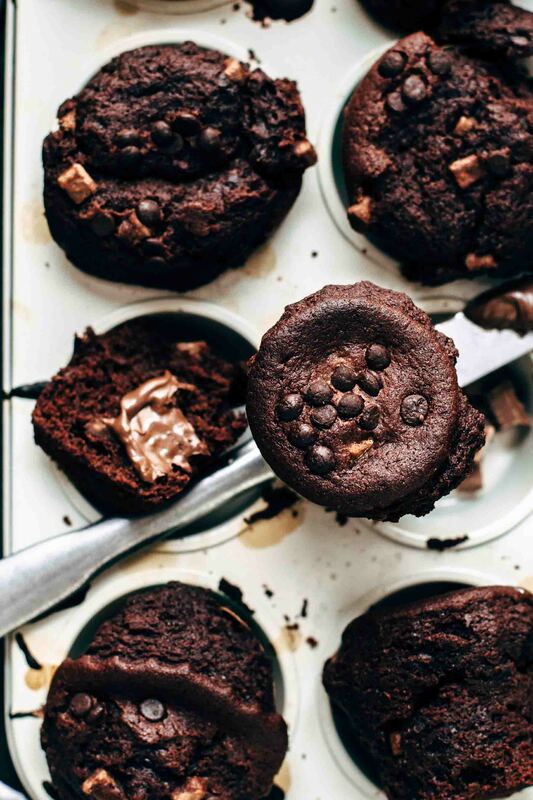 Double Chocolate Muffins time, guys! Grab a coffee and let’s chat about my latest obsession. 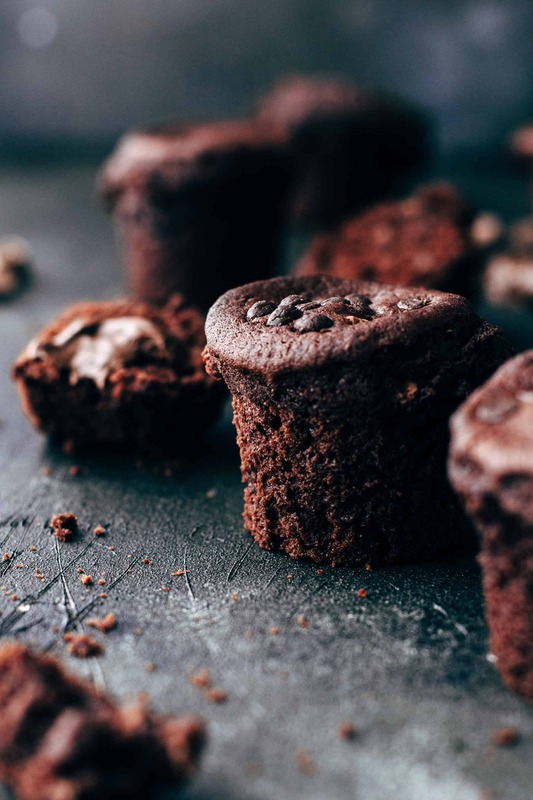 These Double Chocolate Muffins are so intense chocolatey that you will freak out with the very first bite. 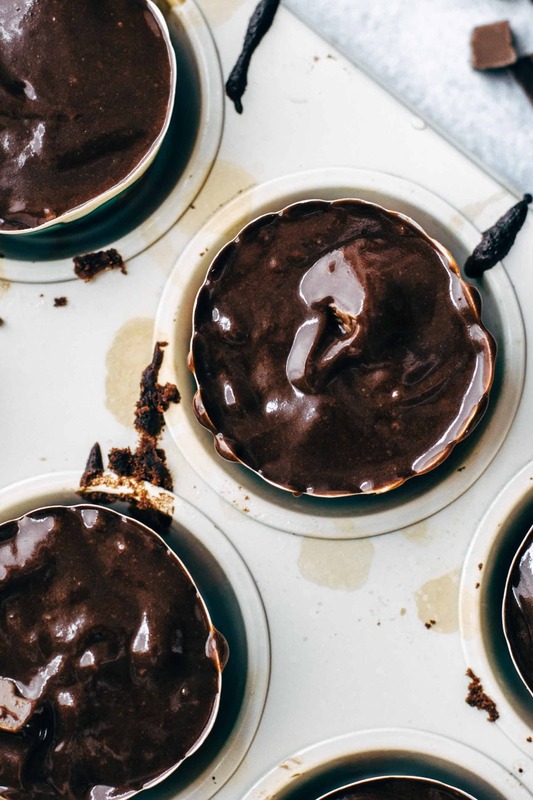 If you are a chocoholic like me, this recipe will kick you out of your socks. They are soft, super moist, and not too sweet but extremely chocolatey. The texture is not dry like regular muffins often are. I added more oil to the batter to get more of a cupcake like texture. 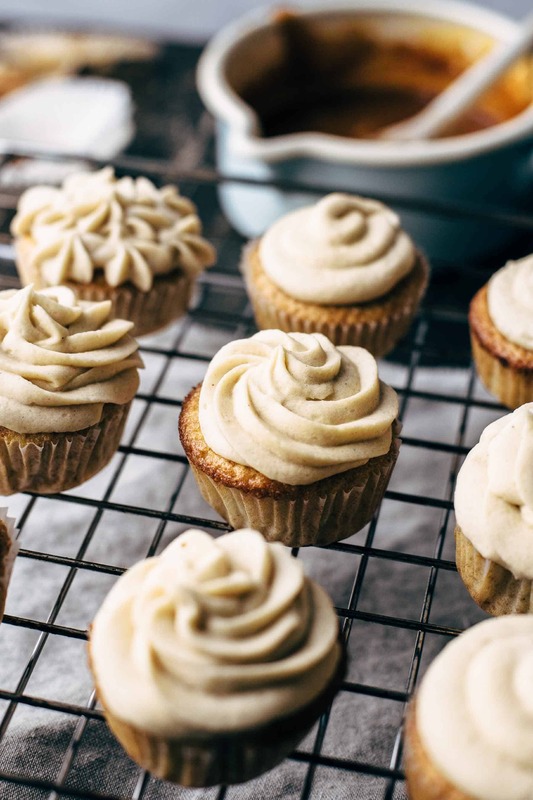 Do you actually know the difference between a muffin and a cupcake? The only two differences are that you frost a cupcake and a muffin not and a cupcake batter is more liquidy compared to a muffin batter. Reason number 2 is because muffins are often packed with nuts, fruits, or chocolate. To prevent sinking to the ground while baking the muffin batter needs to be a bit thicker. 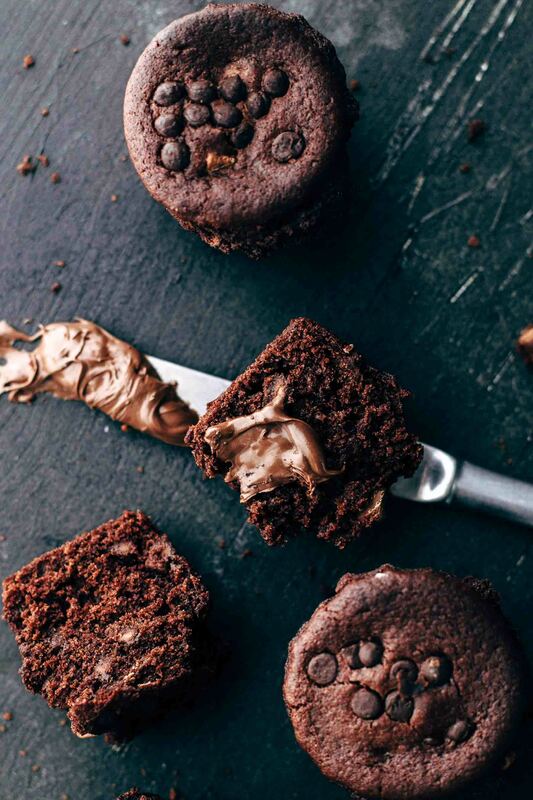 These Double Chocolate Muffins are a hybrid if you want to. A cupcake/muffin hybrid. Soft and moist like a cupcake with bit denser texture that the chocolate chips don’t sink to the ground during the baking process. What I really love about this recipe is that it is so easy and fast to make that you can make these muffins even if you are in a hurry. You need just two bowls, one for dry ingredients and one for wet ingredients. Then stir everything together, spoon the batter into muffin liners and put them straight into the oven. I recommend using high-quality chocolate chips or chop a chocolate bar from a brand you love into chunks. Lindt or Hershey’s are my favorite chocolate brands by the way. Sorry, for crushing your summer-bikini-plans with this recipe. 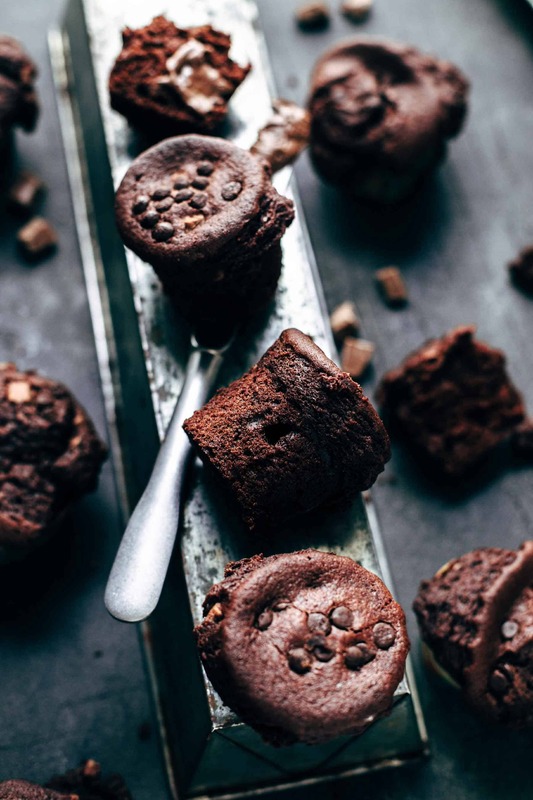 If you make this super soft and moist Double Chocolate Muffins recipe, leave a comment, rate it and tag a photo #alsothecrumbsplease on Instagram! Would love to see your snap! 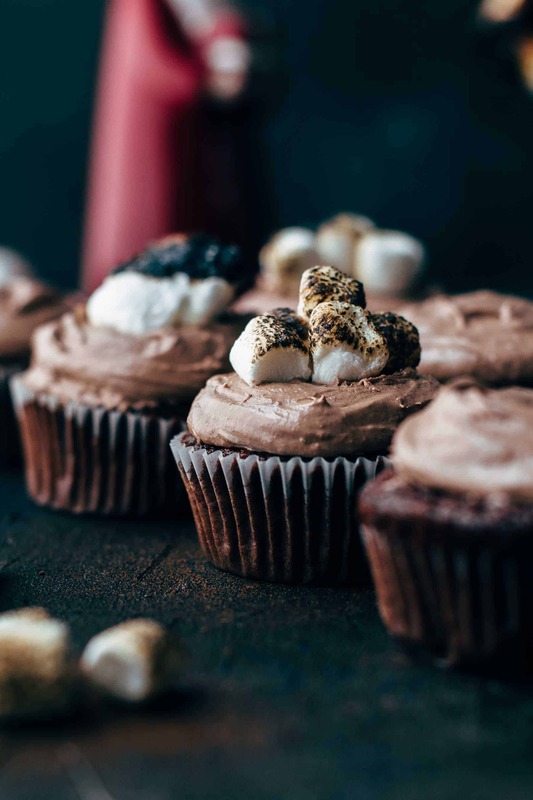 You may also like Perfect Hot Chocolate Cupcakes, Salted Caramel Vanilla Cupcakes, White Chocolate Cupcakes with White Chocolate Frosting, Blueberry Cheesecake Muffins, or click here to see all things sweet. Preheat oven to 425°F (220°C). Line a 12 muffin pan with muffin liners. Set aside. In a large bowl sift together flour, sugar, cocoa, baking powder, and salt. Stir to combine. Set aside. In another large bowl whisk eggs, buttermilk, oil, and vanilla just until combined. Add dry ingredients and stir to combine. Fold in chocolate chips. Divide batter into muffin liners and sprinkle a few additional chocolate chips on top (if desired). Fill liners almost full. You will get about 12 muffins. Bake for 5 minutes at 425°F (220°C) then lower the temperature to 350°F (175°C) and bake additional 15-17 minutes or until a toothpick in the center comes out clean. Let cool to room temperature. Store leftovers at room temperature up to 3 days. Yummy! Can’t wait to try! Enjoy it and have a great Sunday, Karly! Hi! Is there any substitute for buttermilk? Can I replace milk for buttermilk? Thanks! Hi Jackie, Yes use 1 tbsp of white vinegar or lemon juice and enough milk to measure 1 cup. Have a great day!